Marble is a metamorphic rock that developed from limestone. Most of the material is calcite (a crystalline form of calcium carbonate, CaCO3) and dolomite. It is often used for sculpture, as a building material, and for many other purposes. The word 'marble' is also used for other stones that can be polished well and for ball shaped objects used for child games. 'Faux marble' is a wall painting technique that imitates the color patterns of real marble (not to be confused with paper marbling). 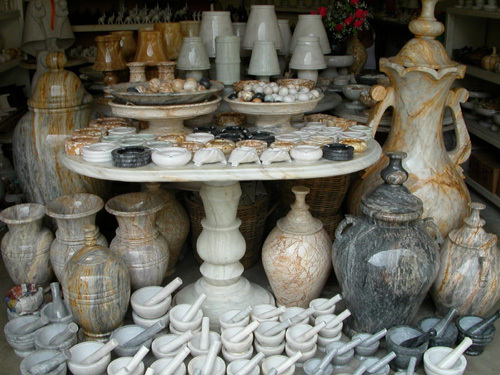 Marble dust can be combined with cement or synthetic resins to make reconstituted or cultured marble. Marble has been used in construction for thousands of years. It was widely used by Greek and Roman sculptors and architects. 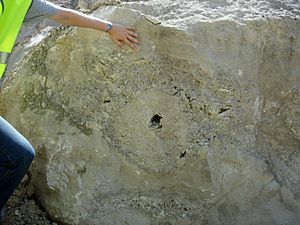 Places named after the stone include Marble Arch, London; the Sea of Marmara; India's Marble Rocks; and the towns of Marble, Minnesota; Marble, Colorado; and Marble Hill, Manhattan, New York. The Elgin Marbles are marble sculptures from the Parthenon that are on display in the British Museum. They were brought to Britain by the Earl of Elgin. In the construction trade, the term "marble" is used for any massive, crystalline calcitic rock (and some non-calcitic rocks) useful as building stone. Purbeck marble is a fossiliferous limestone found in the Isle of Purbeck, a peninsula in south-east Dorset, England. It has been quarried since at least Roman times as a decorative building stone. The industry is no longer active. 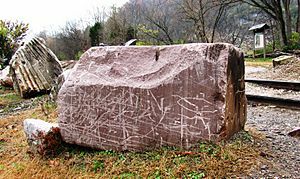 Tennessee marble is really a massive, highly fossiliferous gray to pink to maroon Ordovician dolostone, known as the Holston Formation by geologists. However, Tennessee marble is not true marble. Its crystalline nature gives it a resemblance to marble, especially when polished. Carrara marble is a genuine marble. It is white or blue-grey and of high quality, popular for use in sculpture and building decor. It is quarried at the city of Carrara in the Lunigiana, the northernmost tip of modern-day Tuscany, Italy. 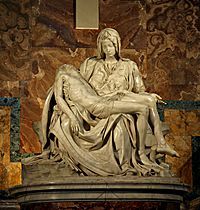 The illustration shows the Pietà, which is a masterpiece of Renaissance sculpture by Michelangelo. It is in St. Peter's Basilica, Vatican City, and is the only piece Michelangelo ever signed. Colorless marbles are a very pure source of calcium carbonate, which is used in a wide variety of industries. Finely ground marble powder is a component in paint, toothpaste, and plastics; calcium carbonate can also be reduced under high heat to calcium oxide (also known as "lime"), which has many uses including being a primary component of most cements. Carlo Franzoni's sculptural marble chariot clock depicting Clio, the Greek muse of history. Marble Facts for Kids. Kiddle Encyclopedia.